Does the world need more dessert with peanut butter cups? Duh. I’ve been on a banana kick this summer, and it’s probably just me making up for lost time. I barely posted any banana recipes in the first two years of the blog, so this summer it’s just bananas all the time. Plus, I don’t like to keep them on the counter in the summer. The bugs, they will come. Plus, this feels like the right time to write about this cake. There’s a slice of it on my desk in my new office, and I’m looking out at the tree by my window and contemplating happy thoughts. 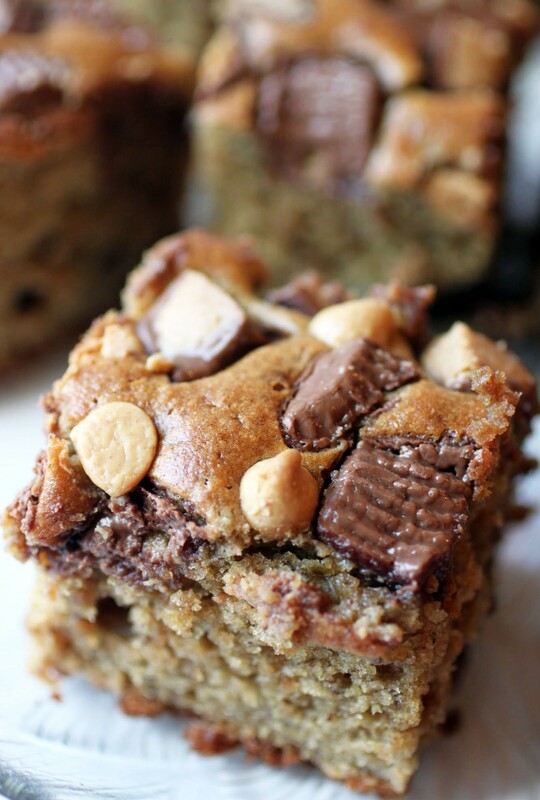 Why not add a moist banana cake filled with both peanut butter cups and peanut butter chips to the mix? A gluten-free one, might I add? I’ve never had a tree by a window where I work, and I’m finding it to be a very cheerful thing. There’s something about connecting to nature when you spend the day encased in cinder block that is very soothing. The cinder block leads me to my big question here. You ready? Adhesive. Yes, I said adhesive. I’ve been doing a lot of wall mounting as I set up this office, and things keep falling down. Seriously, one crash after another. I’ve been using adhesive mountings because I can’t make holes in the wall, but it’s not going well. You see, cinder block is very resistant to adhesive. Any tips? And no, super glue is not one of them. I can’t do that. Or crazy glue. Or any glue at all. Can you help me before I lose my mind? If I hear one more thing come crashing to the floor, I might run for the hills. 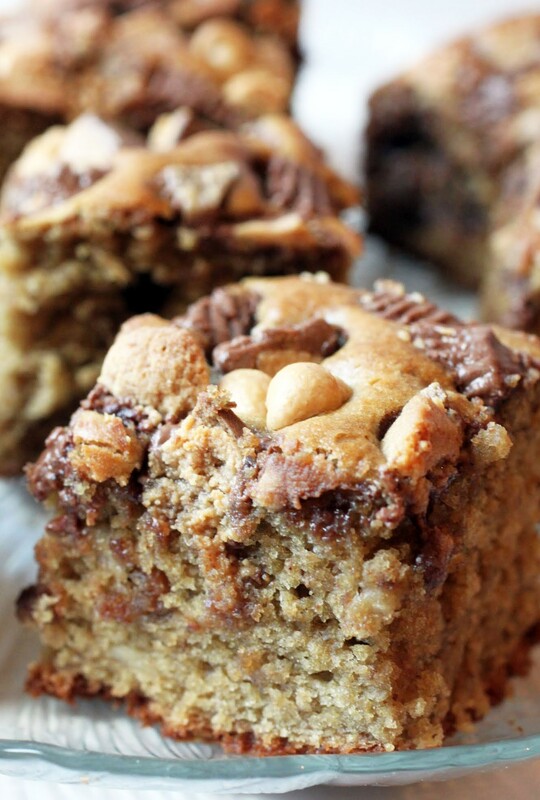 A few months ago, I made this banana toffee snack cake, and people loooooved it. Seriously, I can never predict what people will go for. I make the most amazing thing and the pictures turn out great, and barely a reaction. But sometimes, a recipe just goes sailing through the interweb in the most gloriously unpredictable way. This, then, is an experiment. I used the same cake base, but I changed up the mix-ins. To be honest, I love both versions. If they were my children, I’d love both equally. But as a peanut butter lover, I’d have to direct you toward this one. I mean, come on. It’s so happy. 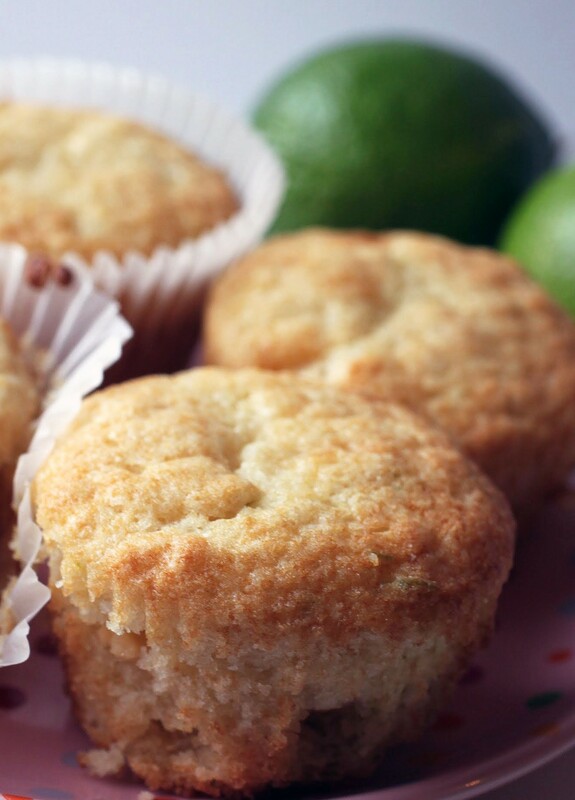 Like my other banana recipes, this one is effortlessly gluten-free, thanks to oat flour. And it’s also super easy with no mixer or crazy bowl action needed. That means if I see a banana on the counter, it’s getting baked. This recipe is too simple not to go for it. If you have any help to give me with adhesive matters, let me know. I need it. Pleeeeeeease! Preheat the oven to 350. Line an 8-inch square pan with foil and coat with cooking spray. Set aside. In a large bowl, combine the oil and brown sugar, mixing until smooth and all the brown sugar lumps are gone. Add the eggs, yogurt, mashed bananas, and vanilla. Mix well. In a small bowl, combine the oat flour, baking soda, salt and cinnamon. Add the dry ingredients to the wet ingredients. Mix until well combined. 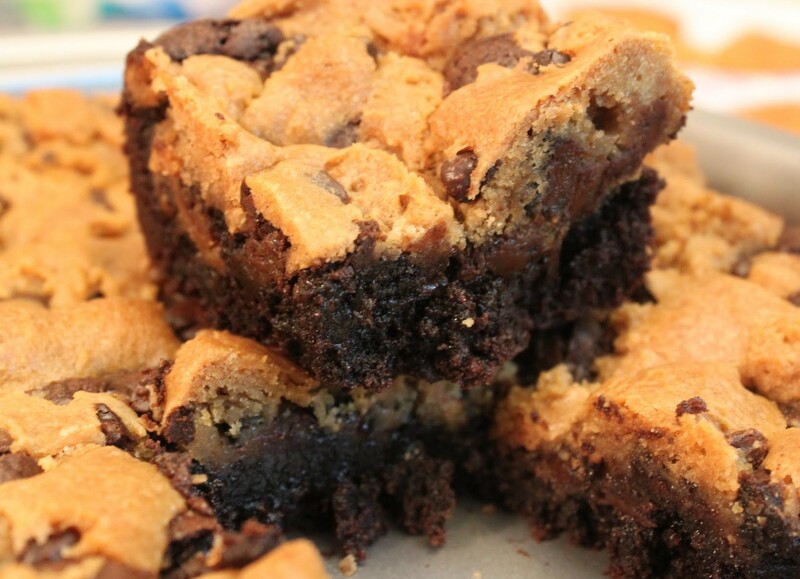 Take half of the peanut butter cups and peanut butter chips and mix them into the batter. Pour the batter into the prepared pan. Sprinkle the remaining candy on top. Bake 30-35 minutes until the a toothpick inserted into the center of the cake comes out clean. Cool completely. Cut into squares. Store covered. Happy New Year! It’s my first post of 2016, and I’m so excited to see what this year will bring! If there’s one food I want to see lots of in the coming year, it’s homemade bread. We’re all familiar with the yeasty goodness of bread that doesn’t come in plastic bags from the grocery store, and it’s so easy to get a perfect loaf with just a little help from my best friend, a.k.a. the bread machine. Life was so cold and dark before we met! Luckily, fresh bread is always possible, and this one is special. It’s made with mostly whole wheat flour, which will help you stick to your healthy eating resolutions. 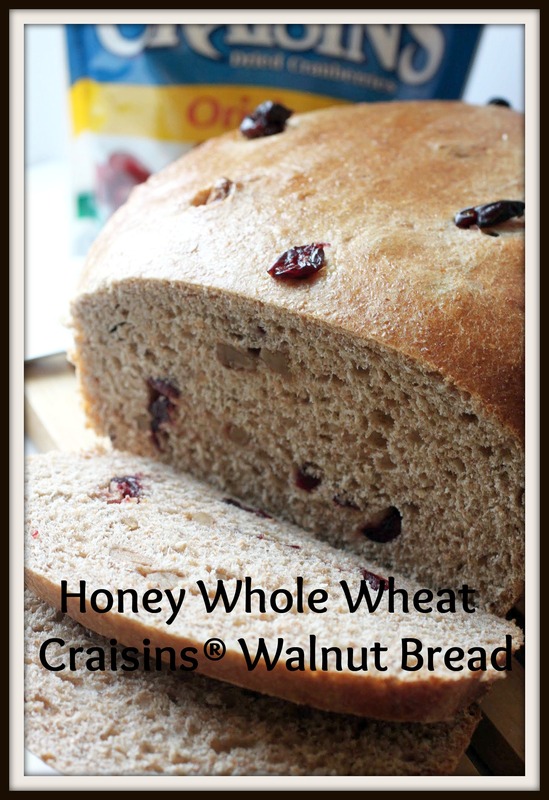 It’s also full of walnuts for an extra protein punch, not to mention sweet Craisins® Dried Cranberries. It’s a loaf worth making! Muffins make the world go round. Well, my world, anyway. There are certain days (or weeks) when facing the day is just hard. Maybe I have to work a 12-hour day before heading home to my kids, or maybe a student of mine has been going through something rough and I’m absorbing the pain. It’s not always cake! On days like that, I need an easy breakfast to throw together. This muffin base is simple, butter-free (and therefore a health food, of course), and easily customized. I chose lime zest (a.k.a. summer in a whiff) and white chocolate chips, but you can use any old mix-ins. It’s all about making your mornings as happy as possible! Is it just me, or have women engineered our lives so that we have no time at all? See, we have rights and we can work and vote and do all those great things. Super! I’m excited to be alive in this time, really I am. But why does having permission to be considered equal to men translate into women suddenly being superheroes? Because I am, ya know. Sometimes I lie back against my fluffy pillows at the end of the day and just sit there, dazed at how much I could pack into a day. And I’m not bragging, because I’m not pretending to do it well or anything. But somehow, it’s totally legit for women to figure out how to pack in work, family time, exercise, errands, logistics (don’t get me started on how much we plan), general hygiene, and oh so much more in one day. Every day. Relentlessly. I’m not necessarily complaining, mainly because I’m lazy and tired and don’t feel like opening that can of worms right now. I’ll open it next week. I’m just trying to explain how I wound up baking when I had no time. These bars, to be exact. More peanut butter cups are definitely needed all the time! Love that you added them to banana cake, Mir! This is just about the perfect sweet treat! I’m all in favor of more PB cups as a general rule! This is a wonderful amount of peanut butter cups in this cake. Something addictive happens when peanut butter and bananas meet…and I like it! This sounds amazing! So true. PB and banana are addictive! Mir, I wish I had some tips for you on mounting stuff on a cinder block wall – gah – if only Home Depot had cinder wall hooks or something! 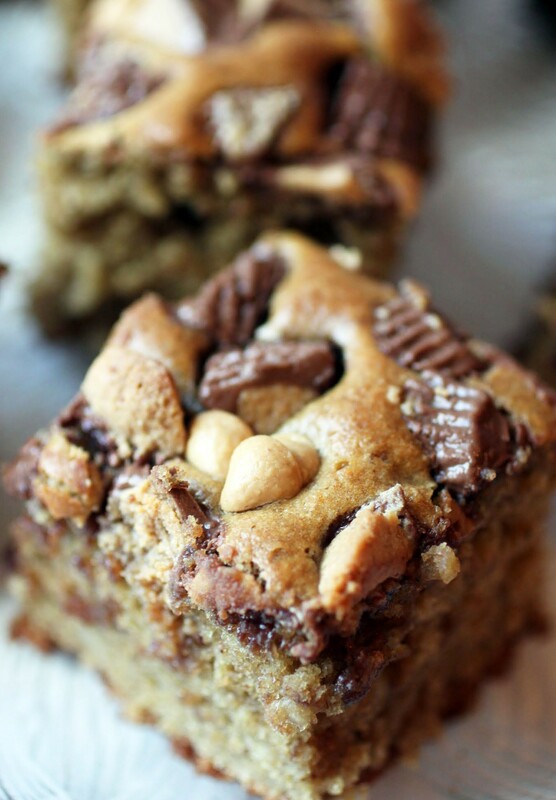 By the way, I wouldn’t mind staring at a cinder block wall with a slice of this decadently moist, gluten free banana cake filled with peanut butter cups and peanut butter chips! I’m so loving the vanilla Greek yogurt you used – do you think I could use coconut oil instead of canola? I don’t have any canola at home. Good luck hanging stuff on that wall – and thanks for this recipe – I bet it will go viral! Oh well. I’ll figure out the cinder block. At least I have cake taken care of! Hmmmm… I’m trying to remember what the heck I used my freshman year in college for the few months I stayed in a dorm and we had cinder block walls. For the life of me I can’t remember what I used to hang stuff on the walls!! Lemme think on that. Watch, it will probably come to me in the middle of the night. #Insomnia. Anyways, yes to nature out the window as you work. So calming, right!? And as for this cake, YESSS! 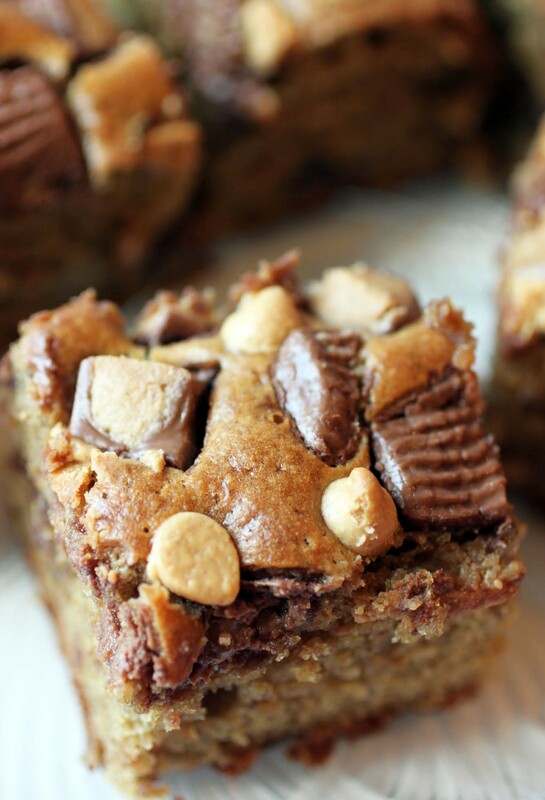 The world totally needs more peanut butter cups… and ‘naners, for that matter. LOVE this, Mir! Looks super delicious and like I could easily demolish 4-10 slices for breakfast, easy. 😉 Cheers chicka! Ha! If it comes to you, let me know. I need hellllp. if you can’t put any holes in the walls, you might be in a tough position. . maybe just leaning a few photos or framed things on your desk and the wall? snap a photo and let us know what you decide to do! 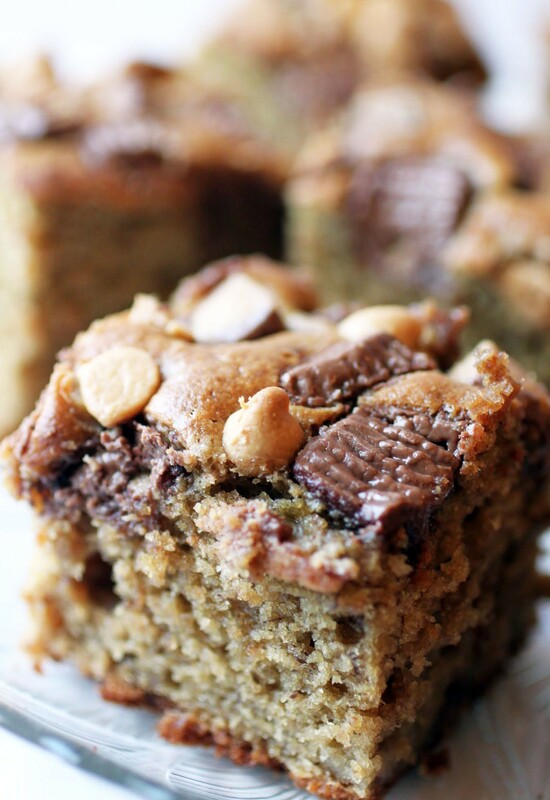 love love love this peanut butter cup banana cake!!! Alice @ Hip Foodie Mom recently posted…16 Zucchini Recipes + $50 VISA Gift Card Giveaway!! I’m a big fan of those decals you put on walls, so that’s helping. And at least I have cake! Ummm…more peanut butter cups? Yes. The answer to that question is always yes. ALWAYS! This cake looks delicious, Mir. Now as far as that wall, I remember we used the blue painters tape in college to hang flyers because it would come off easily. But some of those walls were concrete….I wonder if that would work for you?? Blue tape. BRILLIANT. I just ordered some thanks to you! As for your wall hangings, I’m of no help 🙁 GOOD LUCK! I’ve never been a decorator, so it’s hard. I’m with you on wall hangings, Aimee! Ahhh yes – the trials of decorating an office in a school! I sure do remember those days! I also remember the first time I had an office with a perfect view of a tree…it made all the difference! As would a slice or two of this cake teetering on file folders! Trees are so lovely, aren’t they? This cake looks so so so good!! Chocolate, Peanut Butter and banana? The perfect combo in my book! Love this! Always more PB cups! Always. Regular tape or two-sided, nope. I’ll keep thinking about it! I’m trying the blue tape to see how it goes. Let me know if she has any inspiration! Literally, this is my heaven. Banana + peanut butter = HEAVEN! Totally could not agree more!